Lenin created the first truly modern propaganda machine, and its most colourful, dramatic and original form was the poster. "For the Motherland! For Stalin! For the World! For Communism!" Through it, the greatest artists of the time proclaimed government policies, asked for support, and demanded greater efforts – all with the goal of building Soviet power. 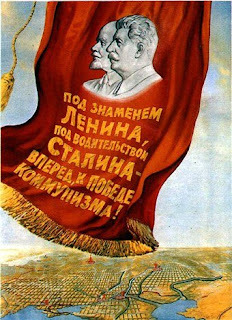 "Under the banner of Lenin, under the leadership of Stalin – Forward, to the Victory of Communism!" Soviet posters are a relatively new area of collecting as they were virtually unavailable in the West until Perestroika. With the decline of Communism, there is more interest than ever in the images from this bold social experiment. 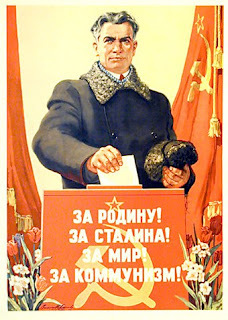 "Under the leadership of the Great Stalin – Forward to Communism!" 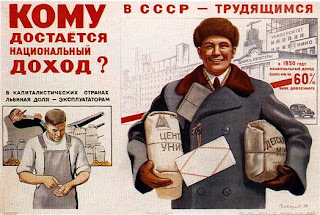 Although most Soviet posters were issued in editions of 5000 to 50000, they are extremely rare today. The primary reason is that most posters – as intended – were posted, and survived only weeks or months. They usually were recycled or lost due to the ravages of war or neglect, while others were destroyed for political reasons. 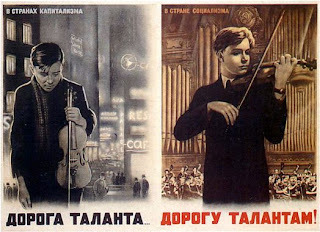 "In countries of Capitalism – Road of Talent; In countries of Socialism – Road to Talents!" The Bolshevik Era (1917-1921) was a life and death struggle for the Bolsheviks and their ideology. Helping to fight enemies within and without, the early Soviet poster was remarkable for its revolutionary fervour and powerful symbolism. "To whom does the national income go? In capitalist countries, the lion's share goes to the exploiters; In USSR – the working class." 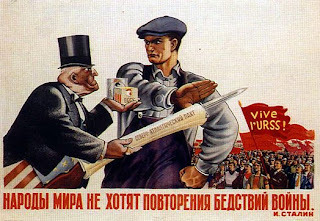 The New Economic Policy (1921-1927) was a period of recovery and relative freedom for a country ravaged by war, famine and bitter discontent. The commercial and film posters of the 'Roaring Twenties' were remarkable for their avant-garde constructivist style. "Don't be naughty!" 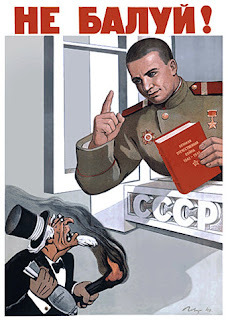 – A Soviet officer (holding a book on Soviet WWII victory) to a malicious, atomic-bomb-wielding, American Uncle Sam. 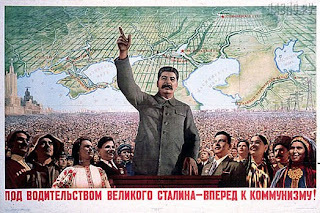 The First and Second Five Year Plans (1928-1937) were Stalin's draconian push to convert Russia into a fully communist industrialised power. The great photomontage posters of the First Five Year plan echoed the heroic side of this effort, only to be followed by the purges of the late '30s and the retreat from avant-garde art in the Second Plan period. "Nations of the world do not want the recurrences of disasters of war." 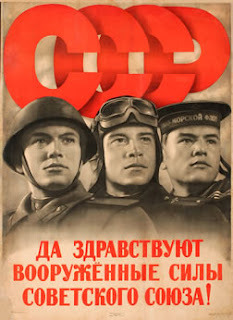 The Great Patriotic War (WWII) (1939-1945) brought a revival of the great age of the Bolshevik poster. The Soviet struggle for survival forced a return to symbolism that fanned the patriotic fires of the heartland. "The sniper hits from afar, but always for sure!" The Cold War (1946-1984) brought a return to 'Social Realism', with utopian views of Russia and Joseph Stalin predominating. In its middle years, the best images featured Vietnam and the space race. As Perestroika (1984-present) dawned, the most powerful images were protest posters created and posted at great personal risk. 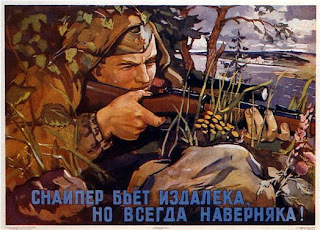 "USSR – Long live the Armed Forces of the Soviet Union!" nice stuff! where'd u get the posters from? … Unbelievable , but I just found software which can do all hard work promoting your wonghongweng.blogspot.com website on complete autopilot - building backlinks and getting your website on top of Google and other search engines 1st pages, so your site finally can get laser targeted qualified traffic, and so you can get lot more visitors for your website.